Welcome to Lac Courte Orielles lake! LCO is a spring fed 5139 acre lake with a max depth of 90 feet. The lake water clarity is very clear. Our cottage is located on the waters edge on a quiet private road great for walking, running and biking. It features 235 feet of shoreline to ensure privacy. This includes a private dock with two adirondack chairs to relax on at the end of it. This 1928 cottage was recently restored with a washer/dryer onsite. The cottage has two bedrooms, two baths and the living room has a wood burning fireplace and for additional sleeping options a queen hideaway sofa with a feather bed is available. There is a fire pit and a grill available as well. Truly a unique relaxing location with a go back in time vibe. The cottage is close to Hayward, Stone Lake and Spooner for day trip adventures or take advantage of this premier lake, by paddle boarding, swimming, fishing, canoeing or kayaking. Sit back and listen to the loons call in a delightful location. Winter activities are abundant as well. Enjoy the American Birkebeiner, snowmobiling or snowshoeing for fun! Renters bring their own towels for kitchen and bath. Hobie Pedal Kayaks available for rent 400.00 for the single, 450.00 for the tandem per stay. Rental contract required to rent, in addition to home rental contract. Lots of courses in this area. We would highly recommend our stay at this lovely cabin by the lake. It is just beautiful! The views are picturesque with the lake framed by gorgeous towering pines. We spent many a pleasant moment in front of the warm and inviting stone fireplace. Loved it! We are so happy you enjoyed your stay! We would love to have you come stay with us again! My husband and I, along with our two dogs, really enjoyed our stay here. We came up for the Birkie so we got to enjoy the beautiful Hayward winter in an incredibly comfortable warm & cozy cabin. The interior is gorgeous, very open & full of windows with a gorgeous view of the lake. The bedrooms were comfortable and the kitchen had everything we needed for our stay. We are so happy you enjoyed your stay! The Birkie is always such a fun weekend in Hayward! We enjoyed having you as our guests. We would welcome you to come back anytime! This cabin is cute and perfect for a small family or group of friends. The fireplace is amazing & made our winter trip so cozy! We spent most of the time in the cabin, relaxing, listening to podcasts or watching Netflix & just recharging our batteries! It was a perfect escape. I imagine it’s beautiful and fun in the summer, too! We are so happy you enjoyed your stay! Thank you again for staying at our cabin! You were wonderful guests and we hope to see you again! Have a wonderful 2019! We had a great experience. Kitchen well stocked with cookware. Great decor! My family and I really enjoyed the cabin. Very clean, Very private, better than pictures. Will be back! Had a wonderful/relaxing week on the lake! Very nice and relaxing week spent in WI. Home has everything you could possibly need! Gail was available to help us with anything that we may of needed. Awesome time and would highly recommend staying!!! FRIDAY TO FRIDAY RENTALS IN JUNE-SEPT. Fishing is great on this lake. Water is clear. There is a sand bar, where people gather, and kids play. Just look around you will see it, its hard to miss! Two great places to grab food/drinks on the lake. Trails End Resort is on the east end of the lake. 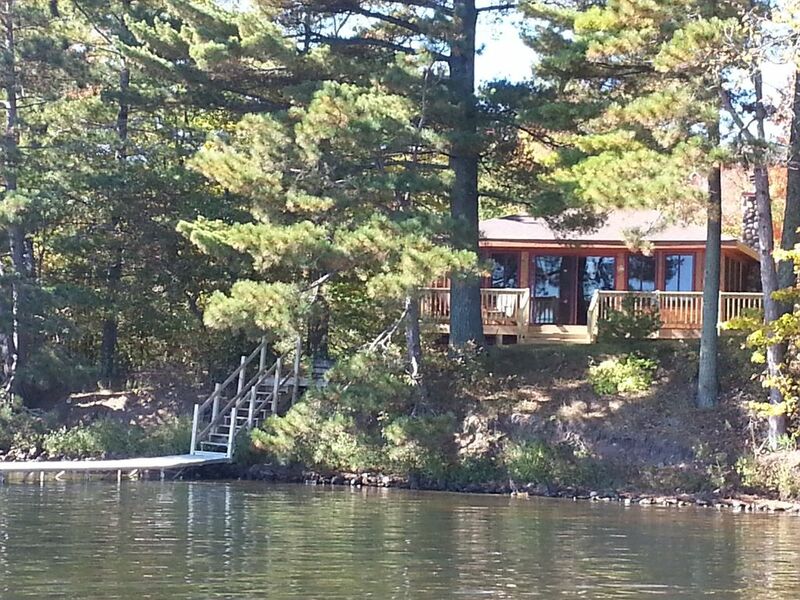 Anglers Haven is a short five minute boat ride from the property. Pizzas, appetizers and drinks! KTwo Kayaks are available for rent. One is a tandum the other is a single kayak. Both are Hobie Cat pedal kayaks! Rent both for 250.00 a week. First Payment is 1660.50 includes tax, and Damage deposit. (refundable pending no damages) 2nd payment is due 60 Days prior to rental amount due on 2nd payment is 1160.50 Holiday rates are at 350.00 per night, 3 night min.